Many traders and Wall Street experts aren't sure the US economy will keep expanding beyond next year, but Katie Nixon of Northern Trust Wealth Management said it could have years of decent growth ahead. Nixon says a series of factors including technology and aging populations are taking inflation out of the picture, minimizing the risk that the Federal Reserve will raise interest rates to the point the economy falls into a recession. The current economic expansion is nearly 10 years old and is close to tying the record for the longest period of growth in the US economy since World War II. The wild stock market volatility of late 2018 was driven in large part by a debate over whether the US economy was about to fall off, or if it could keep growing for another year or so. But what if the end is even further away? 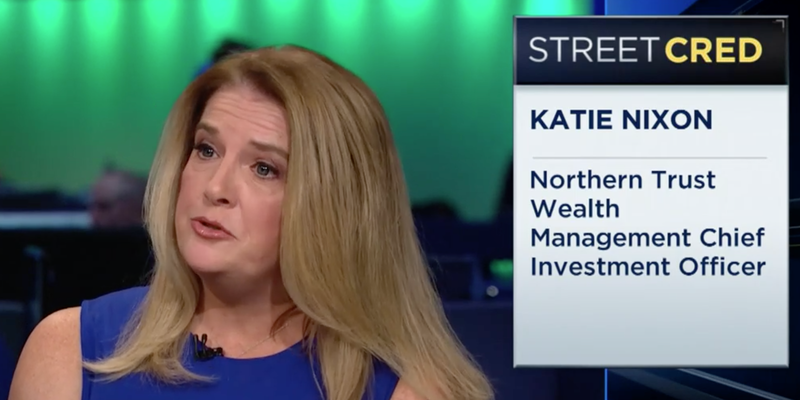 Katie Nixon, the chief investment officer for Northern Trust Wealth Management — which manages $278.6 billion in assets — says it's possible the economy will keep expanding for years to come. That's because she thinks there's little chance inflation will rise to an alarming level. "Inflation globally, including the US, will stay limited for structural reasons,” she said. "We're not going to see the kinds of structural inflation pressures we've seen before." Inflation carries great importance to investors because it largely dictates Federal Reserve monetary policy. One of the chief fears for traders is that inflation will start rising quickly, prompting the Fed to raise interest rates. They're concerned that will, in turn, reduce the appeal of stocks relative to bonds, while also reducing growth and possibly even hurtling the economy into a recession. The fact that inflation has stayed in check has calmed investor nerves that these pressures will mount. Nixon calls the situation "stuckflation." Her view is that the economy may grow at about 2% per year for years while factors like technological advances and the aging population keep inflation from getting too high. She described that scenario as a good one for stocks and other risk assets. Nixon added that it's even possible wages for US workers will start growing at a faster clip without causing much of an increase in inflation. She says that a series of factors are eliminating or reducing one-time sources of inflation. First, new technologies have allowed businesses around the world to get more efficient and reduce costs. Some of those savings are then passed on to shoppers as price reductions. The internet has also made it much easier for shoppers to compare prices, forcing companies to lower them. Second, the US population is getting older, and people tend to save more money and spend less as they age and retire from their jobs. Nixon also sees the US government playing a role. She says as government debt cost rise, the government could spend less on services. That would reduce growth, but also takes away some inflation pressure. Many of those factors apply in other major economies and not just the US. Nixon noted that inflation in Europe and Japan is even lower and the populations of those countries are aging as well. Lastly, she said there are some early signs that key contributors to inflation like health care costs and housing costs could come down. In the end, last year might have been the best for the US economy since 2005 — final government data hasn't been released yet — but it's widely expected to cool off now. And for Nixon, if last year didn't lead to a big increase in inflation, future, slower-growth years won't either. "If there were pressures on inflation we would have seen them already," she said.